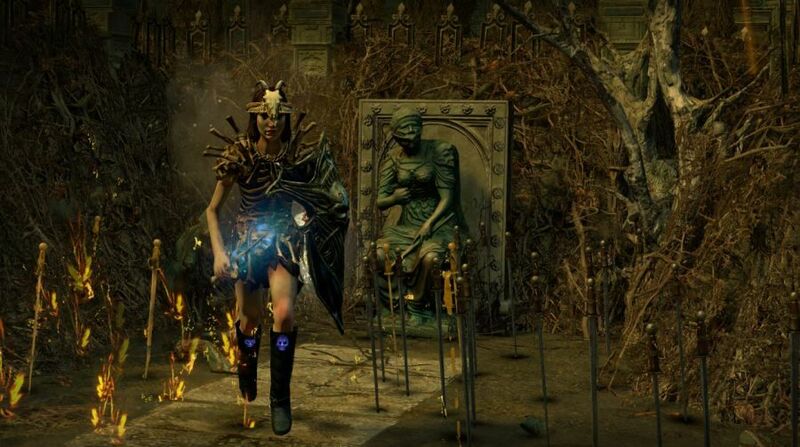 Whether it’s a new league or you’re new to the game, this Path of Exile starter build for a Necromancer will help make leveling up much easier for you. If you’re like me and have wanted to try a good, but super cheap build (for start), then this is exactly what you’re looking for! This build will rely heavily on you summoning Zombies and Skeletons. This is the build if you want to clear all game content with minimum effort and investment. No matter if you are an experienced player and want to have a chill game, or you are new to the game, this build is going to make everything super easy (because you don’t have to do much). What you need to keep in mind about this build is that the skeletons and zombies will be your main source of damage, so everything that you do should either make the enemies die faster or buff the minions. This is the Skill Tree. Ascendancy skill order: Invoker, Bone Sculptor, Flesh Binder, Puppet Master. – For leveling you are going to need a Tabula Rasa, which you can either farm in the Blood Aqueduct or buy. – Violent Dead is a gem that you get from Act 5, but you will need 2 of them, so buy the other (it’s cheap). – The rest of the gear should have Life and resistances (have them capped) until later on when you can swap to better stuff. – It might be hard to play with skeletons until later on, so you can level with Summon Raging Spirit instead. – As a shield you will want is Victario’s Charity, to be able to buff the minions. – Look for a good one handed weapon (Scepter, Mace, Wand) with lots of minion damage, it shouldn’t be very expensive nowadays. – Find a good rare 6-link body armor with Life, Mana and some Resistances, and try crafting “+1 to maximum number of skeletons”, but until you find that a good 5-link body armor will suffice. 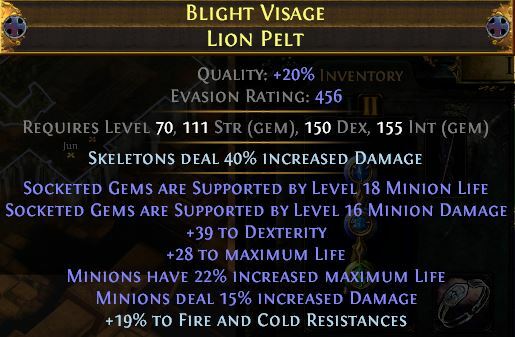 – Get an Elder hat with Minion Damage and Life, or even better, Minion Damage, Minion Life, and Life. – Try getting the labyrinth hat enchantment that gives “Skeletons deal X increased damage”. – Get boots with Life and Resistances, and if you have mods after, craft Movement Speed. – Get a belt with Life and Resistances. – Jewelry with Resistances and Minion Speed (or Minion Damage if you find), I prefer Two-Stone Rings. This build is pretty easy, in the sense that you can play it pretty chill, while enjoying a cup of tea or so. The minions will do everything for you, so all you have to focus on is keeping them summoned. I suggest summoning 3 to 6 minions for the average monster packs, and 12 if there is a shrine or so nearby. For your zombies to become active, you will need to get closer to the monsters / bosses, so make sure you do this with Shield Charge for the Fortify buff. Since the AI of zombies and skeletons is different, take into consideration this way of clearing the maps: send skeletons to clear on one side (since they are pretty aggro and don’t follow you around) while you go with the zombies to the other side. Whenever you fight Bosses / Strongboxes / Abyss make sure you summon all skeletons (and zombies if they died) beforehand, because that will make things muuuuuch easier! Always try to position yourself behind your minions, because they will body block the incoming projectiles. That way you can safely avoid a lot of the damage of bosses / monsters. I suggest keeping some extra gems on your secondary weapon to level them up, and try to Vaal them later on (once they hit level 20 and once you make them 20%). This is great because like this you can try to get level 21 gems, or +23% quality on them. This will be it for our best Path of Exile starter build for a Necromancer! If you have any questions related to the build or would like to know more about it, leave a comment down below and we will get back at you!